It was an interesting Jazz Fest this year. This time, we learned our lesson. We bought 5-dollar chairs! 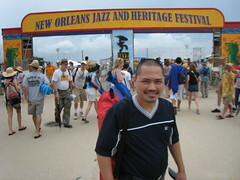 For many years we have gone to Jazz Fest, we never used chairs. It was always hard to sit in the grass. Anyway, we arrived at the racetrack where it was. We also enjoy the food at the event. 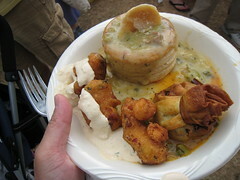 Cochon de Lait Poboys, Crawfish Beignets, Crawfish Sack, and Oyster Patties. Yumm! We got to see Cowboy Mouth! They were awesome! However, it rained all day. We waited for Billy Joel. I couldn't take pictures because it was just pouring rain. It even flooded at some areas knee deep. Billy Joel sang his songs from the 70's. And "Piano Man" was the last song of course. Everyone had a great time. Billy Joel got a little wet, too. LOL you missed the Austin Unrun for this? he he he I would have too.. it looks like an awesome time! Glad you had fun! Yeah, we enjoyed it a lot! Except for the pouring rain. uggh! 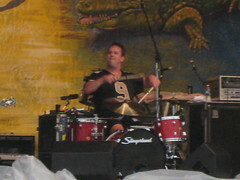 is the singer/drummer of cowboy mouth still as cute as i remember him being in person? Well, it only said milky, but dunno if there were any. 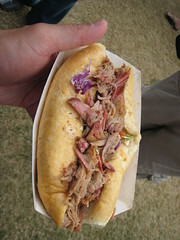 It was like pulled pork. Yeah the drummer/singer is cute. Woofy! I've been telling you that Cowboy Mouth is awesome!!!! I remember watching him doing a solo performance at Jazz Fest at the bleachers. Last weekend, he had a full band. Very talented indeed! I guess the early songs were kinda comparable to Blink 182. But this one sounded more mature, IMO.